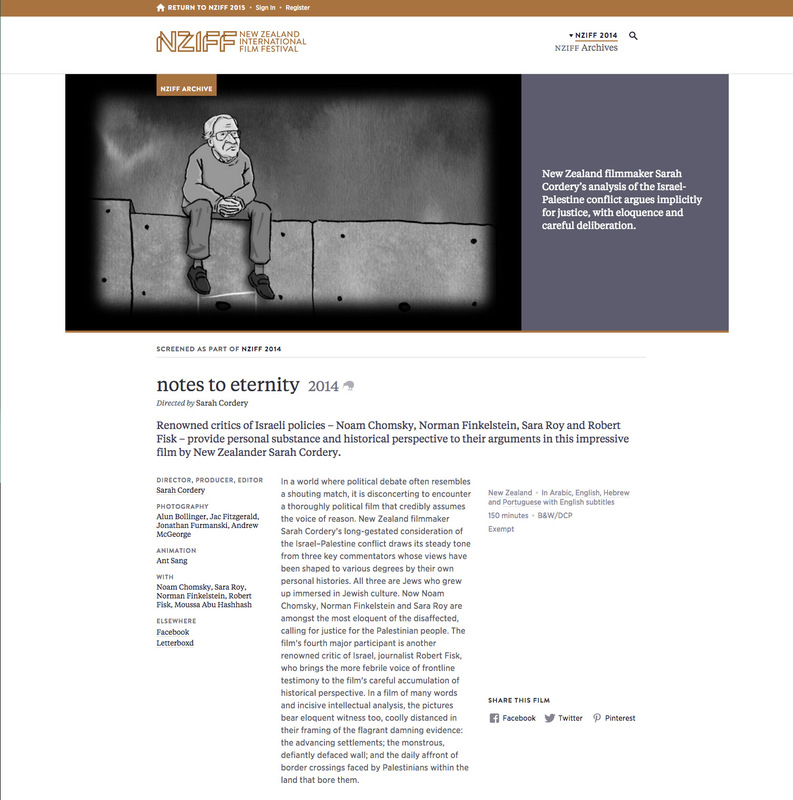 We proudly present notes to eternity in its British Premiere as part of our #DirectedByWomen2017 season. Sarah Cordery’s notes to eternity has booked three stops in the UK in late October, heading for a premiere at London’s Genesis Cinema before trips to Scotland to play in Glasgow and Birmingham for the Screening Rights Film Festival in Birmingham. 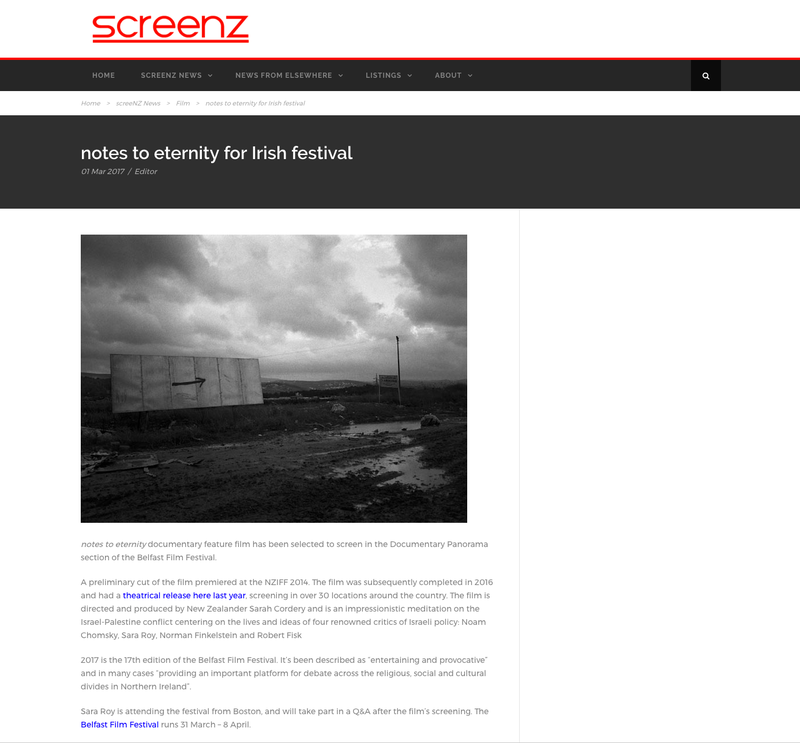 notes to eternity documentary feature film has been selected to screen in the Documentary Panorama section of the Belfast Film Festival. 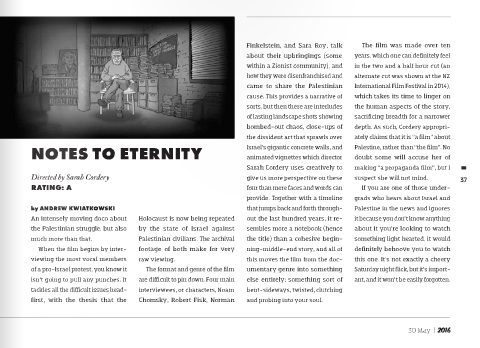 Notes To Eternity is a serious-minded and deceptively even-handed piece of film-making. 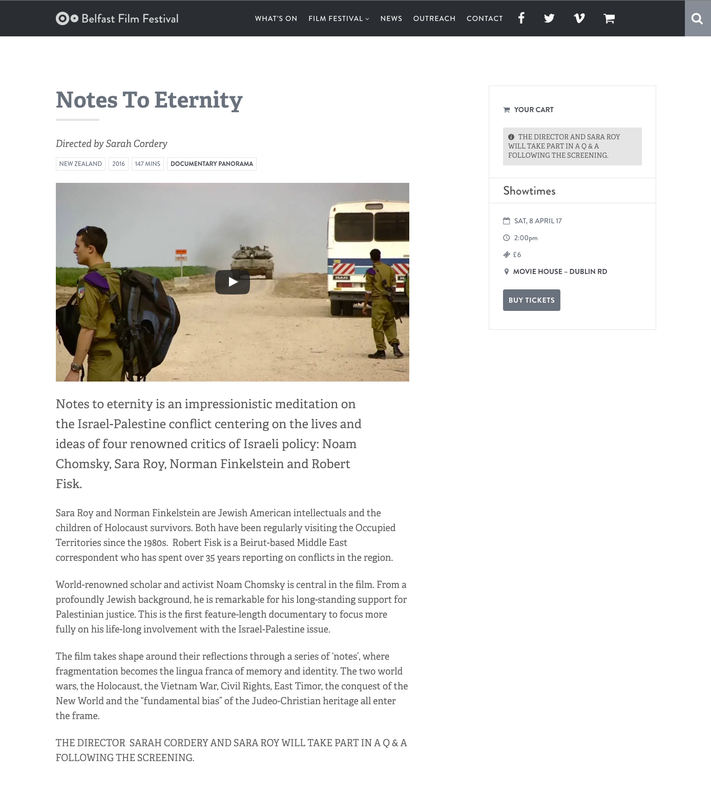 Casting Sara Roy, Norman Finkelstein and Noam Chomsky as her commentators was the masterstroke (and, I guess, the purpose) of New Zealand-based director Sarah Cordery's film. Between them, there is a depth of knowledge of and compassion for the Israeli/Palestinian conflict that is far beyond most politicians or media talking-heads. The trio – and author Robert Fisk – build up a nuanced and surprising picture of how modern Israel came to be and of where – and where not – its existence is still reconcilable with the existence of modern Palestine. An intensely moving doco about the Palestinian struggle, but also much more than that. In a world where political debate often resembles a shouting match, it is disconcerting to encounter a thoroughly political film that credibly assumes the voice of reason. 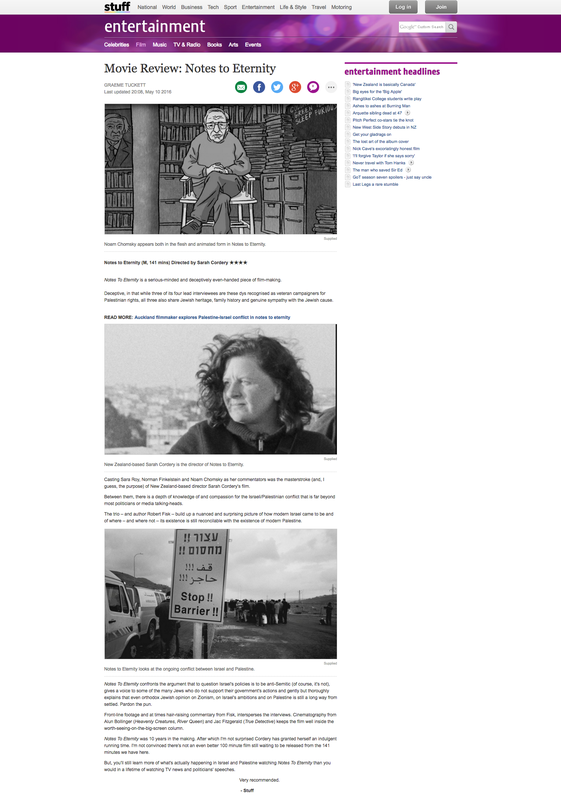 New Zealand filmmaker Sarah Cordery’s long-gestated consideration of the Israel–Palestine conflict draws its steady tone from three key commentators whose views have been shaped to various degrees by their own personal histories. All three are Jews who grew up immersed in Jewish culture. 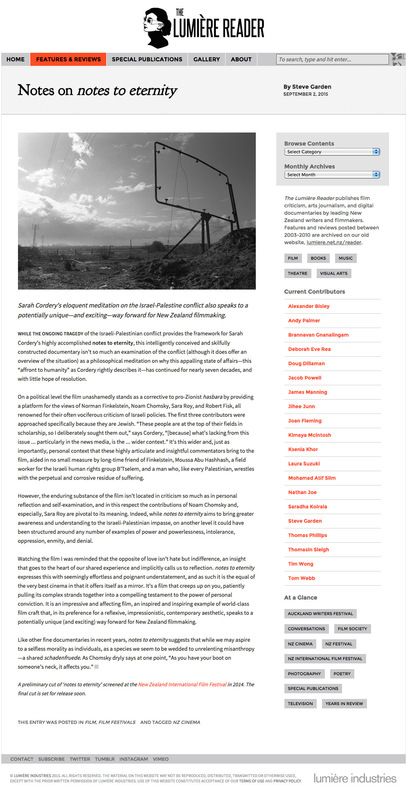 Now Noam Chomsky, Norman Finkelstein and Sara Roy are amongst the most eloquent of the disaffected, calling for justice for the Palestinian people.